Although the majority of bikers and biker clubs today are law abiding and peaceful, the image a real biker wants to put across is still that of a dangerous rebel, a man (or woman) who doesn’t play by the rules and knows how to protect his or her own turf. The hair is tousled; the beard is scraggly; the sunglasses are dark and menacing; the lips sneer; the bandanna is slung around the neck in a devil-may-care manner; the leather jacket is loaded down with gothic chains, like a medieval drawbridge; tattoos all over the place; black leather boots, with silver spurs just right to inflict a deadly slice during a barroom altercation. That’s the look and feel and mindset of the biker and biker chick and their accessories. This is the most important part of a biker’s accessories and wardrobe. Without the right look and style and feel, there simply is no biker – just a faker or a wannabe. Keep the brand name patches to either Harley-Davidson or Ducati. Anything else is a craven sellout. Fake leather is for posers and narcs. A real leather jacket, if taken care of (but not fawned over) can last a lifetime – so even though they tend to be pricey they are worth it because they never need replacing, and they breathe better than any synthetic fabric yet invented. Black is the traditional color for a biker jacket, but biker chicks can get away with off white or even light brown, if they know how to wear it with confidence and swagger. Bikers who enjoy the constant hassle of police and troopers pulling them over for citations can forget about a helmet. That’s about one percent nowadays. Every other biker should look for vintage 1950s helmets online or biker shops. Biker bars often have a sideline of slightly used and vintage helmets – just ask the bartender about his inventory. Are red, with a paisley design. Period. Get American made; the Chinese brands have the paisley design printed on only one side and the cotton is so cheap they rip apart after a few washings. Aviator gargles, black or yellow tinted, are the only way to go. Anything else is too Hollywood. Black leather, and fingerless – for ease in handling the controls. Steel rivets along the knuckles, to show the world that arguments with bikers lead to dentures. Attached to a stainless steel chain and tucked into the back pocket, it holds driving license, cash, condoms, and more cash. Real bikers don’t do debit cards or credit cards – they have the means of producing big bills when needed, no questions asked. A biker chick can pretty much wear whatever she wants in any way she wants. Nobody argues with her about her choice of gems and styles unless they want a fat lip. 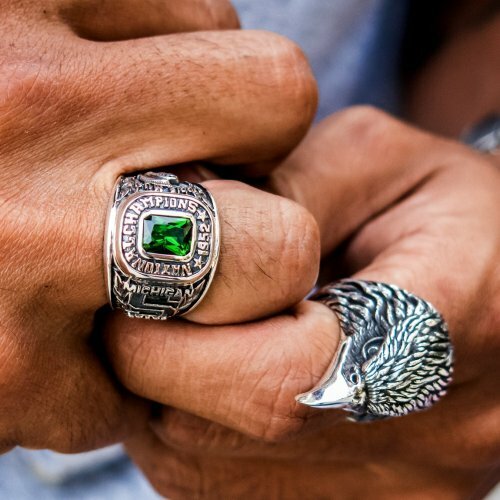 Bikers need to keep their jewelry to a few thick rings made of 925 sterling silver with blood red rubies or screaming green emeralds and skull designs. A gold chain with a Coptic cross is okay, but don’t go all Mr. T with it.